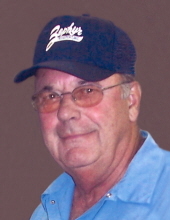 Celebrating the life of James Francis Puhl, Jr.
Obituary for James Francis Puhl, Jr.
James Francis Puhl Jr., 84, of Waterloo, died Monday, January 28, at UnityPoint Allen Memorial Hospital. He was born September 9, 1934, in Waterloo, the son of James Sr, and Mildred Hildebrand Puhl. He married Betty Bandy in Galena, Ill, and she preceded him in death in 2010. He married Peggy Wheeland on February 12, 2012 in Hawaii. Jim served in the United States Navy during the Korean War and was employed as a machinist at John Deere for twenty-nine years. After retirement, he was employed as a truck driver with Stuber and Wheeler Autobody. He was Past Commander of VFW Post 1623 and was able to participate in the Honor Flight. Survivors include: his wife Peggy of Waterloo; a son, Jamie of Waterloo; a daughter, LouAnne (Mike) Kielty of Waterloo; three grandchildren and two great grandchildren; three sisters, Linda (Dennis) Heiser of Waterloo, Paula Floyd of Jesup and Delores Steiner of Waterloo; three step-children, Vickie (Bryant) Baker of Volga, Chad (Crystal) Nicholson of Volga, and KinDee (Eric) Durnan of Wadena; several step-grandchildren and great grandchildren; his mother-in-law, Clara Bohonek of Platteville, Wis.
Preceded in death by: a brother, Doug Puhl; two sisters, Annette Crinigan and Sandy Biretz. Services: 11:00 a.m. Saturday, February 2, at Hagarty-Waychoff-Grarup Funeral Service on South Street with inurnment at a later date in Waterloo Cemetery. Full military rites will be conducted at the funeral home by the Waterloo Amvets Post 19 and Evansdale Amvets Post 31, assisted by the Naval Honor Guard. Public visitation from 4-8 p.m. Friday, February 1, and also one hour prior to services Saturday. To send flowers or a remembrance gift to the family of James Francis Puhl, Jr., please visit our Tribute Store. Visitation also one hour prior to services at the funeral home. "Email Address" would like to share the life celebration of James Francis Puhl, Jr.. Click on the "link" to go to share a favorite memory or leave a condolence message for the family.